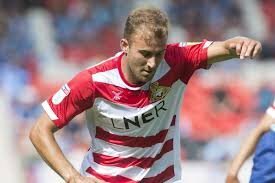 The EFL Awards were held on Sunday and among those to be recognised was Doncaster midfielder Herbie Kane. The youngster has had an excellent season on loan at the Keepmoat from Premier League side Liverpool as Donny chase a play-off place come the end of the campaign. “We’re doing well as a team at the moment. At first I didn’t really know what to expect but I’ve just adapted to everything and I feel as though I’ve taken everything in my stride really and I’m happy at Doncaster and I’m doing well. Certainly, Rovers seem a buoyant side at the moment with stars like John Marquis and Mallik Wilks also doing the business. “I think in football you have to be confident and we’ve got plenty of players that can win us games so I think personally we can do it. “Work ethic is one of the things he focuses on. Kane, of course, is on loan from Liverpool and the Reds will surely be watching with a keen interest as he continues to excel. He’ll have a tough job of getting into Jurgen Klopp’s side, but he does have plenty of ability and, clearly, potential.